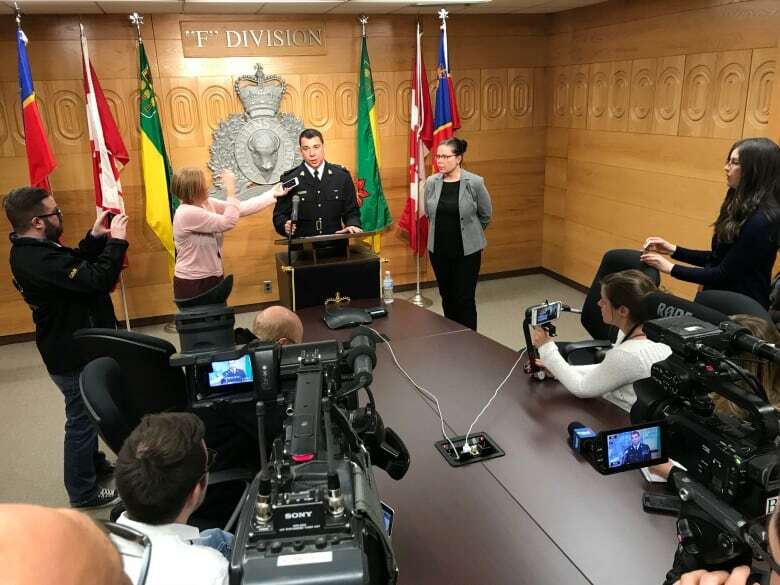 The RCMP confirmed 14 fatalities and 14 injuries in a collision involving a junior hockey team's bus in Saskatchewan on Friday, with rescue efforts ongoing late into the evening. Semi-trailer collided with passenger bus about 30 kilometres north of Tisdale, Sask. Police say there were 28 people on the bus at the time of the crash, including the driver. Three of the injuries are critical in nature. RCMP would not confirm whether the deceased were players or coaches as they work with partner agencies to notify and support families. Tom Straschnitzki, the father of Ryan Straschnitzki, one of the players injured in the crash, said his son suffered a severe back injury. "He's alive and breathing, and from what we know he has a broken back, and as of now, can't feel anything from his waist down." "I think he's still in shock, still asking how everyone is and who perished and who didn't." "He remembers he was in the middle of the bus and then he remembers waking up when the paramedics took him off the bus ... and he said, 'I thought the semi T-boned right in the middle,' but he said, 'no, it was in the front of the bus.'" Tom and his wife will be leaving Airdrie, Alta., today to see their son. 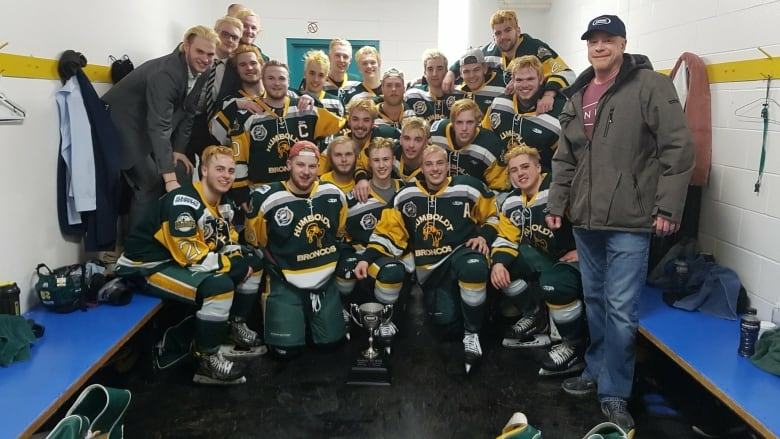 The Nipawin Hawks of the Saskatchewan Junior Hockey League say the crash involved the team bus of the Humboldt Broncos, who were on their way to Nipawin for Game 5 of its SJHL semifinal series. The crash happened about 30 kilometres north of Tisdale, Sask. The Hawks had been scheduled to play the Broncos on Friday night, but said on Facebook shortly after 6 p.m. CST that the game was cancelled because of the crash. "Our community is in utter shock and we are trying our best to comes to grips with this unimaginable tragedy," Broncos president Kevin Garinger said on Saturday morning. Like others in the small community of nearly 6,000, he said he knew each of the young men and staff on the team personally, and had been billeting one of the players at his home. "This is much larger than anyone can begin to imagine." Garinger had been in Edmonton visiting a nephew in the hospital, when he got a call from a fan, asking about reports of the crash. Once he started making phone calls, he learned of the extent of the collision. "We are just in utter disbelief and shock at the loss that's fallen upon us." He said the entire Broncos organization wanted to share their "deepest thoughts and prayers" to those most impacted by the crash, as well as their thanks to the emergency personnel who responded to the crash. Humboldt's Elgar Petersen Arena was turned into a mobile crisis unit, as people gathered to support one another. Some made phone calls as they attempted to learn more about the status of their loved ones. Daigon Elny was a member of the team last year, and was one of the people at the arena. "We were a family," he said. "You come to the rink... what's better than that? "Now I don't know what goes on now." "Words can not describe the loss that we feel tonight," wrote Saskatchewan Premier Scott Moe in a Facebook post. 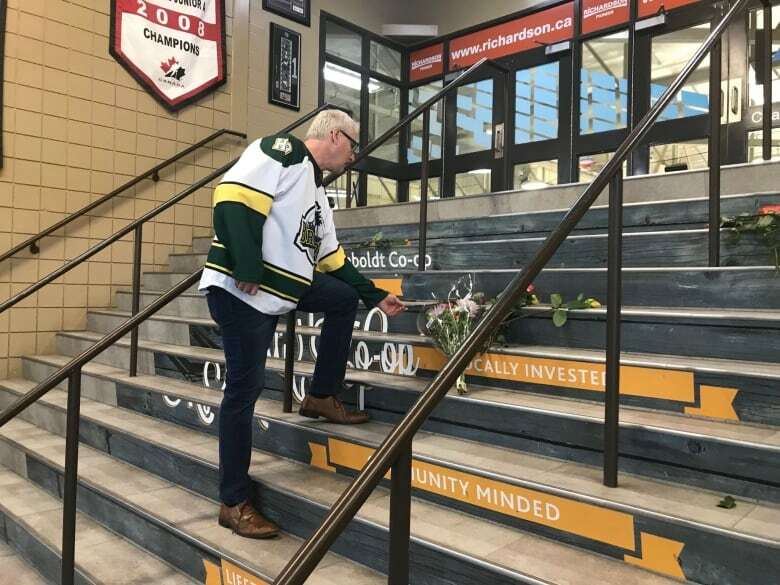 "To the City of Humboldt, the entire Broncos organization, and the families impacted by this tragedy, please know you are in Saskatchewan's hearts." 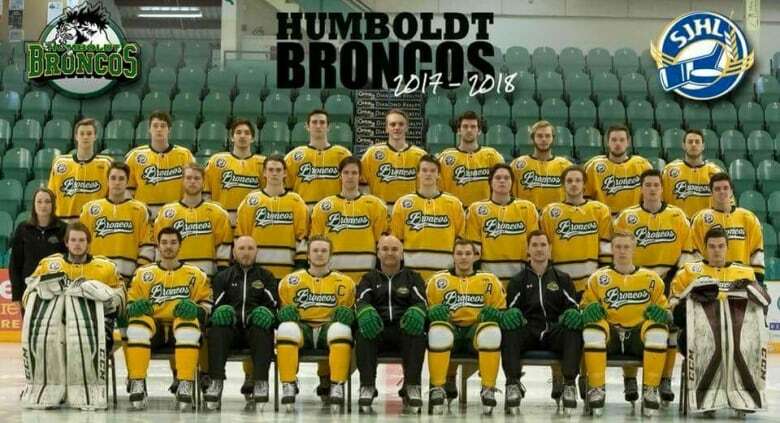 Prime Minister Justin Trudeau expressed his condolences as well, writing on Twitter, "I cannot imagine what these parents are going through, and my heart goes out to everyone affected by this terrible tragedy, in the Humboldt community and beyond." The collision took place Friday evening on Highway 35, about 30 kilometres north of Tisdale, Sask., near the junction of Highway 335, when a semi-trailer collided with the bus, the RCMP said. STARS air ambulance says it sent two helicopters to the scene. A few family members contacted by CBC News said they were waiting to hear more concrete details about their loved ones on the team. The team includes 24 players, all from Western Canada, ranging in age from 16 to 21. Traffic on the highway will be blocked or restricted for several hours and drivers can expect lengthy delays. Drivers are asked to avoid the area, if possible. Humboldt Mayor Rob Muench said he first heard about the crash on social media. "It was horrifying," he said, noting there are a few "local kids" on the team. "It's going to hit the community hard." A team bus carrying fans was also headed to Nipawin for the game. 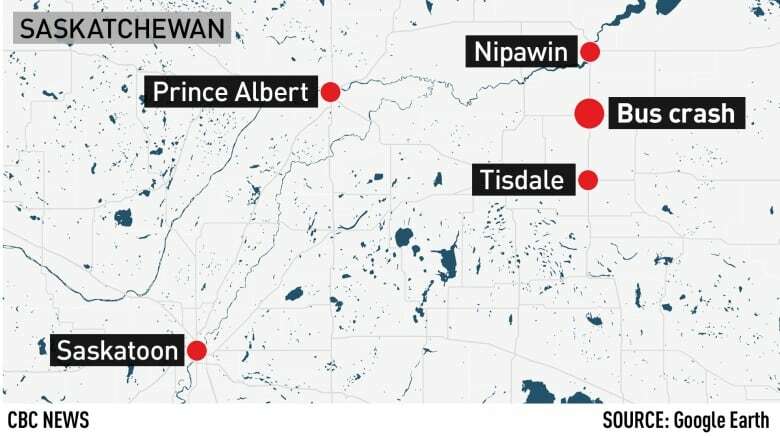 The Nipawin Apostolic Church, located at 109 Fourth Avenue East, is serving as a gathering place for families, and more information will be shared there, according to the RCMP. Emergency services and Victim Services representatives will also be on site. 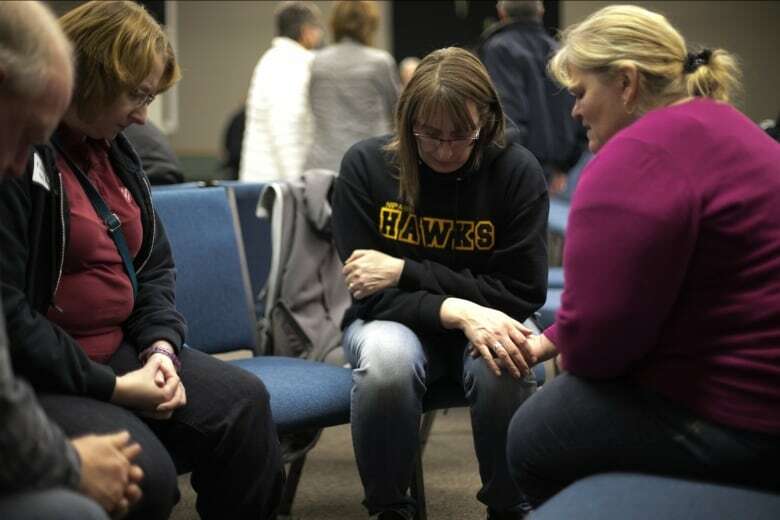 Pastor Jordan Gadsby said that around 100 people were gathered before 9 p.m. CST, including families from Humboldt. The community was coming out to help, with local grocery stores bringing food, while others brought phone chargers and help to connect families with relatives. Those who had heard news about their loved ones quickly left to go to nearby hospitals, while others were still waiting to hear news, he said. Parents and family of individuals seeking information about their family members who may have been in the collision can call 306-752-8700. 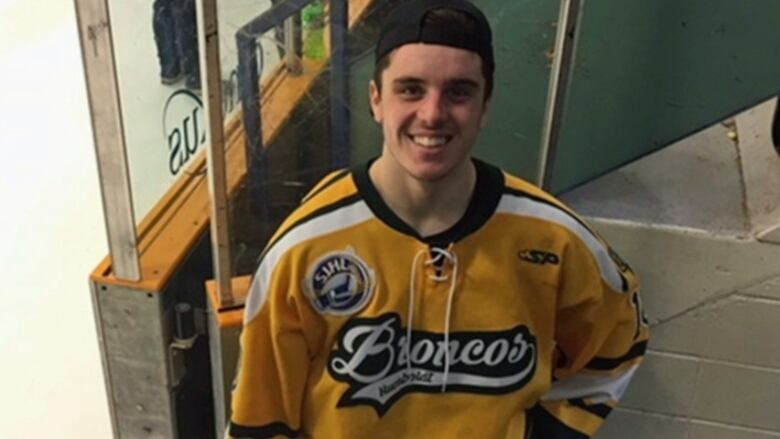 This is the second time a Saskatchewan team with the name "Broncos" has been involved in a highway crash.